A lot has changed since we bought our first home, also new construction, in the neighborhood in 2009. Monetarily, a LOT has changed. Back then, Eric was still on his starting salary after graduating and I was still a year and a half from graduating/bringing in income. Our options were pretty minimal – “dark wood or light wood cabinets”. And we worried and worried that our decision to get hardwood downstairs, a $10,000 upgrade, would come back to haunt us. Of course, we have never regretted that decision. Because we also brought home a puppy we had to house-train as well as a beautiful but very messy baby boy. After Flynn came it became so much more apparent that we had no place to store anything. Since we love parking in our 2 car garage that didn’t leave us many options. The loft and the guest room began to fill to the brim with his baby items and old clothes. There was also the issue of a lack of playroom downstairs. Once Flynn became mobile the toys started to pile up in the living room. Our only option seemed to be to convert our dining room to a playroom and I wasn’t excited to do that. So after Christmas we started looking at houses. 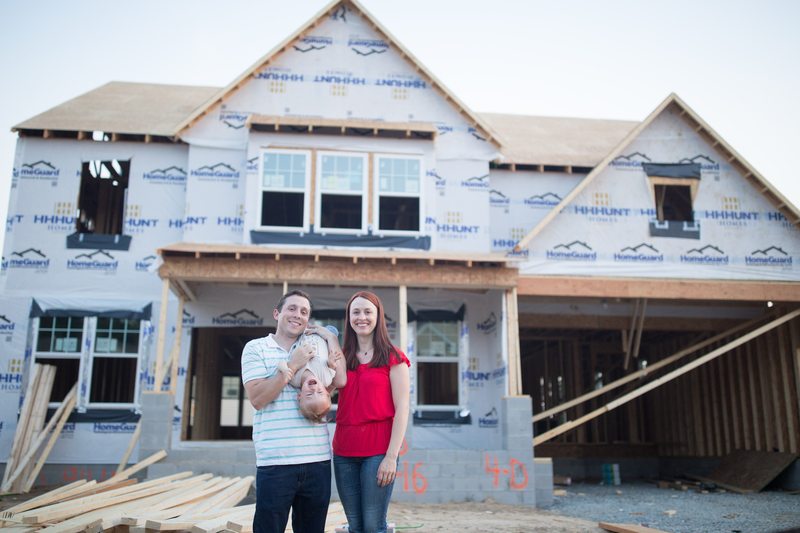 We had talked about buying a lot and building a custom home. But the chance of getting a lot with a good location was not great and we realized we loved the amenities of neighborhood living such as the sidewalks and trails and the proximity to restaurants, Kroger and the interstates. We started looking around at homes in surrounding neighborhoods. We entertained the idea of buying an older home in an older neighborhood. We could save money with the purchase and renovate the kitchen and change it to open floor plan. With the additions we’d be making though the cost would be similar to a new construction home. And at the end of the day, we’d be in an old neighborhood without young kids to grow up with our kids. We drove through lots of neighborhoods, even some newer than ours but we were turned off by the feel of each – some missing sidewalks which we think are pretty crucial to the overall feel and some had big power lines running through the neighborhoods which also wasn’t appealing. We stumbled across some new construction homes in a neighborhood that connects to ours. The builder was a local, custom builder and the thought of having more options was alluring. After touring a few of their homes though we realized the cost would be more than the new construction homes in our own neighborhood. And the floor plan options left us wanting to make lots of changes which of course would mean even more money. I was also turned off by the lack of hardwood flooring as an option. It seemed to me that with a custom builder that should be an option and since it wasn’t I wondered what other things would be taken off the table. We had initially thought the new homes in our neighborhood weren’t worth the money and we were worried we would have to make too many compromises on the floor plan. We decided we’d go look at the model and just see what they had. We loved it and we realized it felt much larger than the other new construction homes even though they were similar square footage. But we still weren’t convinced it was worth the money. We found a large home in the neighborhood for sale built a few years ago and we decide to go take a look. The house had more square footage than many of the new construction homes because it had a finished third floor. When the realtor selling the home, a family friend, showed us the home she told us the home was under contract but that we could look anyway. She heard us as we talked about knocking down the wall to the study to open up the downstairs, paint the kitchen cabinets which were a dark wood and make additions of a fireplace and morning room cutout. The home was selling for 50k+ less than the new homes but with our additions and changes we’d be way over that. And still the downstairs wouldn’t be quite what we wanted. The great room was awkwardly narrow and not conducive to setting up couches around the TV. Also we would want to convert the master bath to a large shower instead of tub. We realized the chances of finding a home in our neighborhood with the options we wanted and the layout we wanted would be next to impossible. We would have to make some concessions and I wasn’t ready to give up on the house we wanted. The realtor suggested we go see a model home in a nearby neighborhood that had recently been added to the floor plans selling in our neighborhood. Her daughter had just bought a new home with this model and she said it sounded like it would be great for us. So we went and visited it and absolutely fell in love. And let me tell you, I did not want to fall in love with this house. I wanted a fixer upper. I wanted more bang for our buck. I wanted DIY renovation where I could live out my HGTV fantasy. But this house just ticked all the boxes. Huge open kitchen. Large counter height island. So much counter space. Windows and natural light galore. Kitchen overlooks large family room. Where the other home had felt narrow and long this home felt wide and short which was just what we wanted making it feel sooo open. I was sold except the price. I still couldn’t stomach that the home we wanted/needed was so much money. Maybe I could find a fixer upper elsewhere. Something cheap that we could turn into our dream home. But ultimately it came down to location. No matter what we did to a fixer upper we could not transplant it to our beloved neighborhood. If we wanted to stay in our neighborhood and we wanted to tick all the boxes, this was the price we would have to pay. And honestly I’ve spent the last 6 months since we went and signed the contract on it doubting myself. Thinking surely I’ve made a mistake. I look at homes for sale almost daily. But I have yet to find a house for sale which is truly a good deal. One we could turn into a home like the one we’re building for similar money. And again. Location. The element we can’t change. So after all my research I’m slowly coming to grips with this decision being the right one. Our neighborhood isn’t perfect. The houses are too close together. The yards are tiny. The through streets get too much traffic. But despite that, it just feels right. The playground. The lake. The people. The runners and kids you’ll see on the sidewalks at any time you go out. It just feels young and active and you can’t breathe that into old neighborhoods. The proximity to downtown. The fact you can go out for a special night in the city and be back in your safe home 15 minutes later. Being halfway between our parents houses. Being just a hop from 295 so that I can be in Chester in just 25 minutes. The Kroger and Dunkin donuts you can walk to. The way the jogging stroller glides down the sidewalks. The craftsman style homes. We became adults in this neighborhood. We grew with it. We remember when it was just a field. We saw as each part was built and weaved into the beautiful place we love. It just feels right.